A variety of agents have been shown to induce transplanted stem cells to differentiate into neurons. Exosomes are very small, hollow particles that are secreted from many types of cells. They contain functional proteins and genetic materials and serve as a vehicle for communication between cells. In the nervous system, exosomes guide the direction of nerve growth, control nerve connection and help regenerate peripheral nerves. In a series of experiments the Tufts researchers showed that exosomes from PC12 cells (neuron-like progenitor cells derived from rats) at various stages of their own differentiation could, in turn, cause hMSCs to become neuron-like cells. Exosomes had not previously been studied as a way to induce human stem cell differentiation. "In combination with synthetic nanoparticles that my laboratory is developing, we may ultimately be able to use these identified miRNAs or proteins to make synthetic exosomes, thereby avoiding the need to use any kind of neural progenitor cell line to induce neuron growth," said the paper's senior and corresponding author Qiaobing Xu, assistant professor of biomedical engineering at Tufts School of Engineering. Xu's work focuses on material science engineering, specifically nanoscience and its biomedical application: the development of new synthetic materials for the delivery of therapeutic proteins and genetic material. In 2015, he received a Faculty Early Career Development (CAREER) award from the National Science Foundation (NSF), funding research into a new way to deliver protein-based cancer-fighting drugs and other therapeutics directly into cells. He was named a Pew Scholar in biomedical sciences by the Pew Charitable Trusts in 2013. 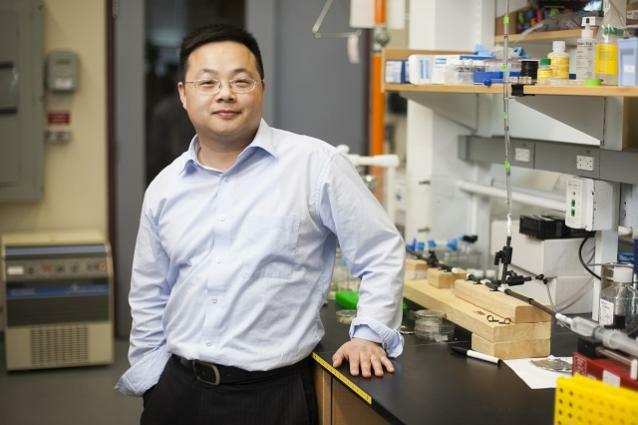 In addition to the School of Engineering, he has appointments in the School of Medicine and Sackler School of Graduate Biomedical Sciences at Tufts University.